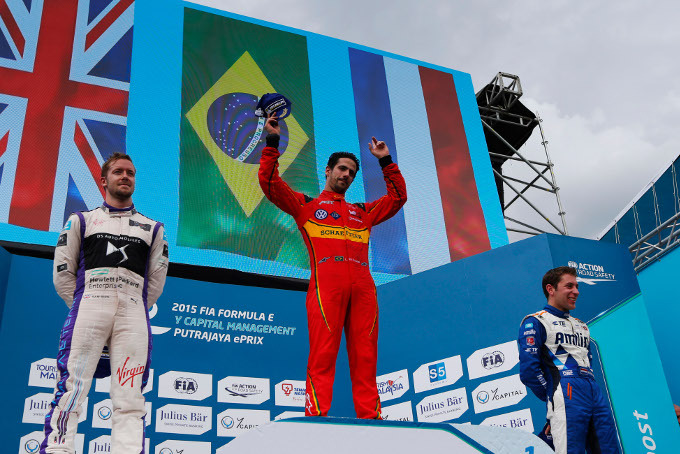 Lucas di Grassi claimed his second FIA Formula E Championship win in a race at Putrajaya in Malaysia that was packed with incident from start to finish. Even before the race had started Stephane Sarrazin was in trouble as his Venturi cut out on the dummy grid. With the Frenchman unable to take up his place on the front row alongside the Julius Baer Pole Position winner Sebastien Buemi, the start had to be delayed as he was pushed to the back of the field. With no one directly alongside him, Buemi had a clear run into the first corner, and as was the case in the season-opener in Beijing, the Renault e.dams driver pulled away into a comfortable lead. But this would be no back-to-back win for the Swiss, as his car ground to a halt as the race neared its mid-way point. With Buemi’s car stopped on track, the team opted to pit his team-mate Nicolas Prost as this point, as he had also been suffering with his car cutting out. The early pitstop ensured the Frenchman took over the lead after the mid-race car swaps took place, but as he had to make his energy last for longer than his rivals, combined with his car troubles he was unable to prevent the trailing pack from passing him. Di Grassi took over in second following the pitstop phase, but only because Dragon Racing’s Loic Duval suffered an over-long stop. The Frenchman had briefly held the lead following Buemi’s troubles, but was now behind not only di Grassi but the impressive Team Aguri car of Antonio Felix da Costa too. As Prost struggled with his car cutting out, di Grassi made his move for the lead. Behind them Da Costa and Duval entertainingly disputed third. Eventually both found a way by the Renault e.dams and Duval started to close in on the leader. But when a damper broke in the suspension of his car, his great run was ended and di Grassi was left unpressured at the front and duly collected the win. After a mistake in qualifying and a brush with the wall, DS Virgin’s Sam Bird started back in 14th. But the 2014 Putrajaya ePrix winner has an affinity with the circuit, and while those around him were having troubles he was able to concentrate on driving his own race, staying out of trouble and when Jerome D’Ambrosio crashed out of second place for Dragon on the final lap, the Brit inherited the runner-up spot. Da Costa’s great run for Aguri ended when his car cut-out too, which handed a podium finish to Andretti’s Robin Frijns. However, the Dutchman was exceptionally fortunate to finish the race after clouting the wall as he made a passing move on the hobbled Duval. Even though the suspension and steering were deranged, he somehow kept the car pointing in the right direction and crawled over the line for his first Formula E podium. Despite his problems at the start Sarrazin came through to fourth, while Bruno Senna took fifth for Mahindra Racing. Da Costa managed to get his car restarted and came home sixth, while Daniel Abt finished seventh for Abt Schaeffler Audi Sport. Nelson Piquet Jr was again a FanBoost winner and kept out of trouble to score his first points of the season for NEXTEV TCR in eighth, while Nick Heidfeld finished ninth despite having been tipped into a spin at the first corner following a three-way tussle with Jean-Eric Vergne (DS Virgin Racing) who was eliminated on the spot and Jacques Villeneuve (Venturi). Prost picked up the final point in 10th, while Buemi had the consolation of securing the Visa Fastest Lap and two bonus points. After one of the most eventful races in Formula E’s short history, the teams and drivers now have a well-earned break before the series resumes in the amazing beachside setting of Punta del Este on December 19. 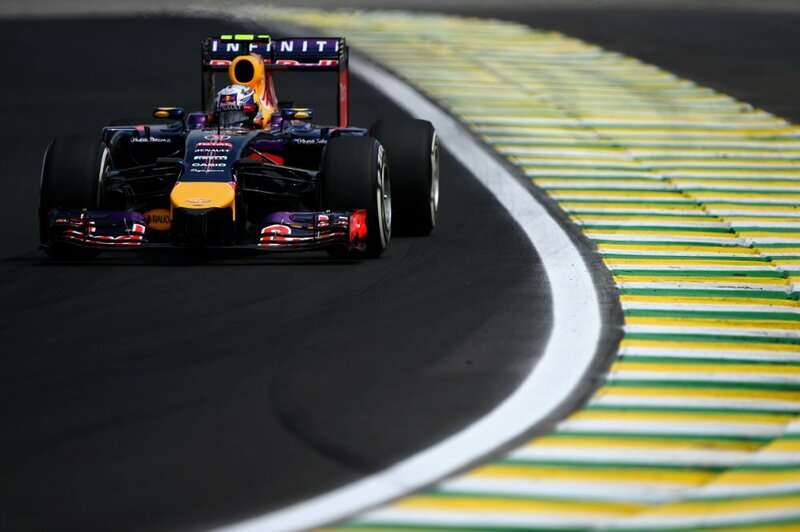 So Daniel, Brazil up next, what’s the secret to a great lap of the Autodromo Jose Carlos Pace? Don’t ask me, I don’t know – I don’t think I’ve ever done one, so I’ve got no secrets! What I have learned is that you shouldn’t think ahead too much. You have to take it corner-by-corner and concentrate on the one you’re in. There’s not many that you string together. There’s not many corners full stop. It’s not your favourite circuit is it? What gave it away? No, Brazil’s a wonderful grand prix with a great atmosphere in an exciting city but the track doesn’t really do it for me. There’s just not a corner that gives you any real satisfaction. I don’t want to make it sound dull, because it isn’t, but like Russia, there isn’t a corner that makes you go Woooo-Hoooo! It needs a few more corners and something really high speed. There’s a couple that look good on paper but because of the cambers, you never really have the grip to go barrelling in. The crowd really gets your heart-rate up before the sessions, so you want to be really on it but instead have to be very patient. How about away from the track, what do you do? 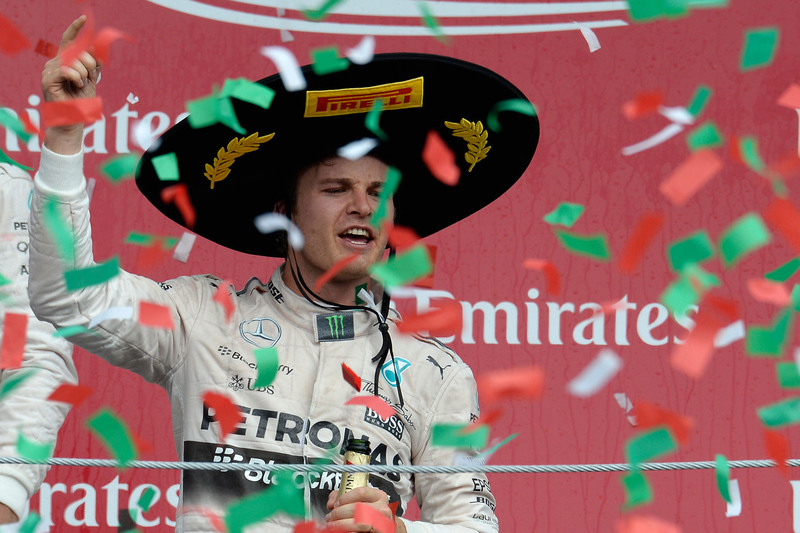 Last Sunday Formula One made its triumphant return to Mexico. For the first time in 23 years the ,albeit somewhat quieter, sounds of F1 machinery could be heard coming from the Autódromo Hermanos Rodríguez. The reception the F1 circus received was nothing short of spectacular, with drivers, journalists, and fans questioning how the Mexican GP ever fell off the Formula One calendar in the first place. The Mexican Grand Prix was a true success in every sense of the word, not only did the fans create a unique atmosphere, perhaps more importantly government and business supported the event. Jennie Gow in her blog for Grid 1 earlier today commented the Mexican GP should act as a reminder that passion is more important that the pound and that F1 should not forget its roots with the future of Silverstone & Monza’s place F1 calenders continually questioned. Whilst I whole hearty agree with the sentiment, for me possible more than the incredible atmosphere in Mexico what was significant about the race was the pound. Not relying on its place in history organisers of the Mexican Grand Prix have invested hundreds of millions in upgrading not only the pit and paddock area, but also the circuit design itself. Taking into consideration both modern safety requirements and maximising fans views and engagement with the cars on track aiming to create a fan experience unique to the Mexican GP. The person that came up with the idea of placing the podium in the stadium section of the circuit ,rather than as is traditional position above the pitlane, deserves every accolade they receive. The track gave the feeling of having the everyday fan at the heart of every decision taken. This focus on the fan paid off. Sell-out crowds, lead to sold out merchandising, and food stalls, exactly what is needed to ensure a venue is profitable. Capacity crowds resulted in FOM world feed broadcasts packed with carnival like images of fans all weekend, relying this message to the millions of viewers at home paid off. Social media was a light with comments around the venue jumping to the top of everyone’s ‘the next race I’m going to’ list. Something the savvy Mexican Tourism board will no doubt capitalise on with the race becoming a stalwart of how the country is promoted. 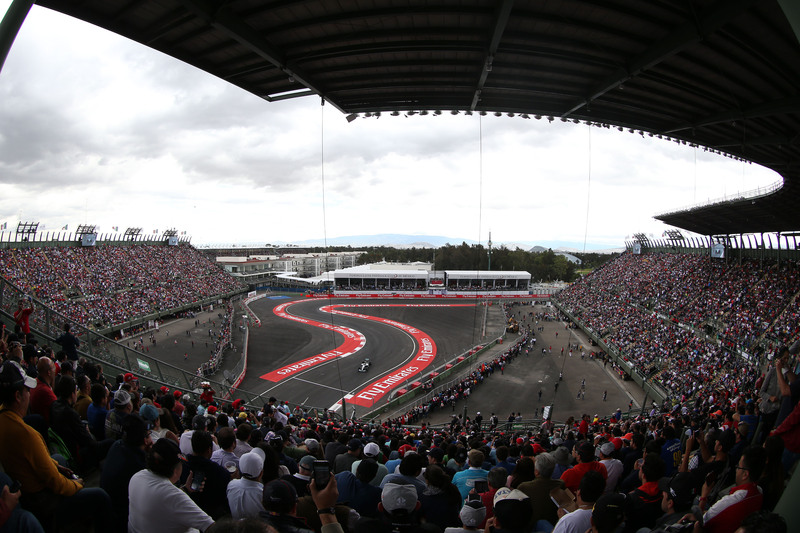 Beyond the circuit organisers, and the tourism board, Mexican business got behind the return of F1 to the country, half the teams on the grid sported additional Mexican sponsorship agreements for the race weekend. None of this happened by chance. The Mexican Grand Prix did not return to the F1 calendar for sentimental value, it earned its place through making a sound business case. To the venue owner, the government and tourism board, to the local economy and to perhaps most importantly to businesses. It was hugely refreshing to see such a dynamic and vibrant event and yes, again echoing Jennie Gow’s comments hopefully some of the ‘new territories’ can take some lessons in how to put on a show, but to me the real lesson should be to those traditional venues. European venues increasingly complain about an F1 event not being profitable, that increasing hosting fees cripple their finances. Perhaps the time has come to look at the product they offer as hosting fees increase their offering should evolve. Government and business don’t see the benefits of a home race because they haven’t been shown in a convincing way. Silverstone, Nürburgring should take the example of Mexico and show the county what F1 could do for them. Retaining a place on the F1 calendar should not be a right, it should be earned. The Mexican Grand Prix serves to show when faced with that challenge the true classic venues are ready for that fight. 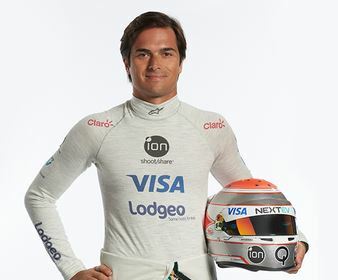 The eagle eyed fan of Formula E may have noticed that since the concluding rounds of the championship in London, former Formula One Driver and inaugural Formula E World Champion, Nelson Piquet Jr. has been sporting backing from Lodgeo. I caught up with Ines Djelassi, founder and CEO of Lodgeo to find out a bit more about the company, to understand what attracted them to Formula E and how fans of Nelson Piquet jr could be in for a bit of treat! Thank you for your time today Ines, to kick things off could you give an overview of Lodgeo? Lodgeo is a hotel market place where consumers and hotel suppliers can buy and sell rooms live at the lowest price available. Once a booking has taken place on Lodgeo, the user can manage all bookings from different travel suppliers from the Lodgeo app, manage multiple credit cards, use the plan your route functionality and more. Current competitors, including Kayak, Trivago and Tripadvisor are still not offering the 100% in app booking functionality and most will divert a user back to a third party website for the fulfilment. Thus creating friction and a very poor mobile user experience. Most importantly diverting a user means not being able to guarantee the lowest price advertised initially. Our new app offers access to more than 1 million hotels globally, through a series of online travel agents. It generates income by taking a cut of the bookings from the travel agents and is free to users. Until now, it has not been possible for consumers to compare prices and book rooms within one app. We hope that Lodgeo will capture a significant slice of the fast-growing market. How did the Lodgeo, Nelson Piquet Jr. partnership come about & what is the length of your agreement? Formula E is new, vibrant, dynamic and trying to innovate in Motorsport. Which is very much aligned with what Lodgeo is trying to achieve in the travel space. Formula E fans, drivers and teams are great and need a lodging partner that will be aligned their company’s vision hence our involvement. What do Lodgeo hope to achieve out of Nelson Piquet jr, Formula E relationship? This partnership is ideal for brand awareness through Nelson’s profile and also because of the different countries that will be visited during the races. We hope to significantly increase our user base with new users installing the app and generate more revenues. Nelson is a frequent user of the Lodgeo app and loves it; we hope that his fans and formula E fans will adopt the service too. Based on your experience to date would Lodgeo recommend Formula E involvement to other companies as a tool to increase brand awareness? Yes we would for sure. How does the cost of Formula E involvement compare to other sponsorship agreements? The deal is a win-win, so the best deal we could have really. 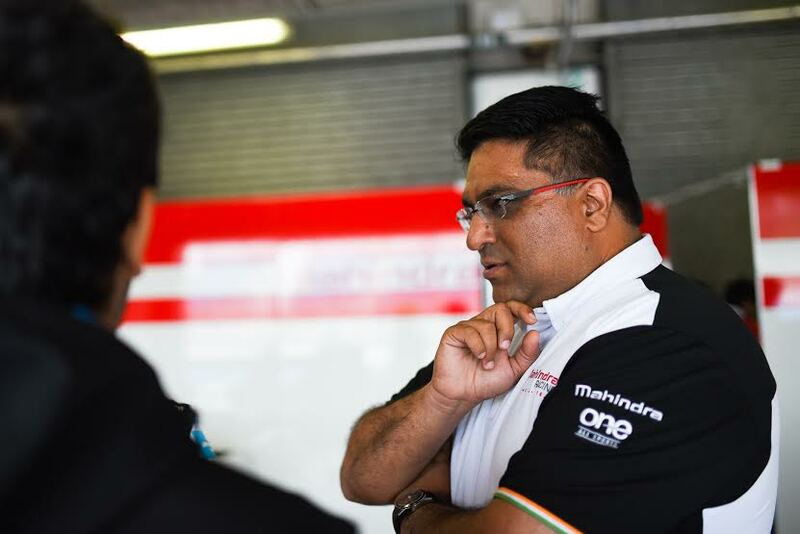 What are Lodgeo most looking forward to ahead of the Formula E season? We are looking forward to having Nelson win again, and to see some new Formula E users adopting the Lodgeo app rapidly! Follow this link to visit the Lodgeo home page. To download the Lodgeo app for apple click here, for android click here. 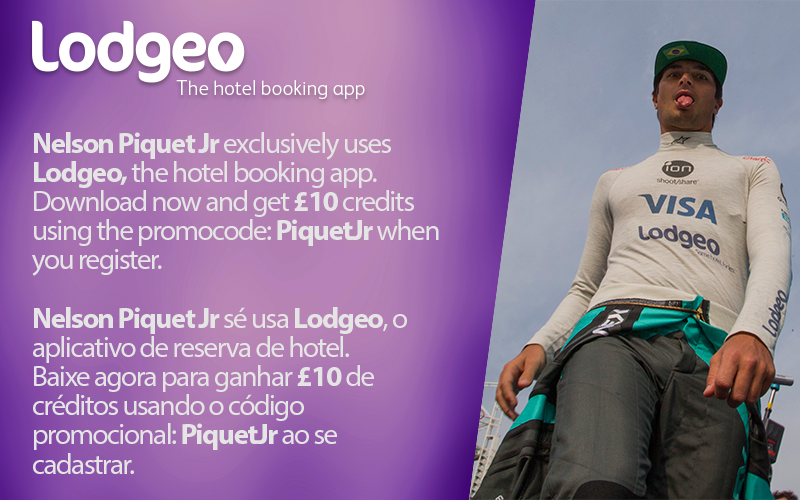 Lodgeo have created an exclusive promocode: PiquetJr for all Nelson Piquet jr fans and supporters. When users register on Lodgeo this code gives users an immediate £10 credit (or equivalent t value in your local currency). Additional credit of £10 (or equivalent local currency value) will be added each time a referred friend registers. The entrepreneur behind a new mobile app that allows users to compare prices for hotels and book rooms is preparing to raise up to £10m to develop the service. Ines Djelassi, who launched Lodgeo in September 2014, is working with advisers on the fundraising. She has previously secured £2m in start-up funding. Lodgeo is Djelassi’s second hotel-related tech venture. In 2012 the French executive sold her previous business, Hotel Solutions Direct, to Eviivo, an internet travel company backed by the Middle East Investment firm Investcorp. If you are interested in exploring the investment potential of Lodgeo please contact with Ines Djelassi by clicking here. Following an agreement ratified by the FIA World Council, Pirelli will hold a tyre test in Abu Dhabi after the final grand prix of the 2015 season. The one-day test will take place on Tuesday 1 December from 9am-9pm continuously, dedicated to slick tyre development. Teams have been asked to run preferably race or reserve drivers, and they will not be allowed to try new parts nor alter the cars during the test. All of the teams involve will field one car each, but participation is voluntary. Pirelli will define the test programme for each car. The tyres used during this test will not be considered as part of the testing allocation for 2015. The Italian tyre firm requested the Abu Dhabi session in order to develop a new construction for the 2016 slick tyres as well as test the new Ultrasoft compound, which will form part of the P Zero Formula One range next year. 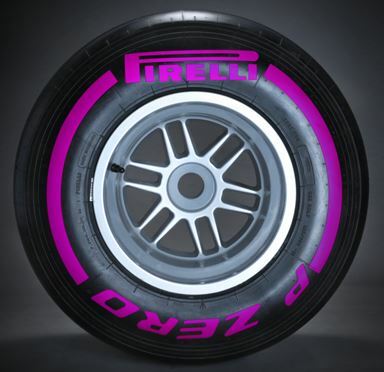 The Ultrasoft will be distinguished by purple markings on the sidewall. 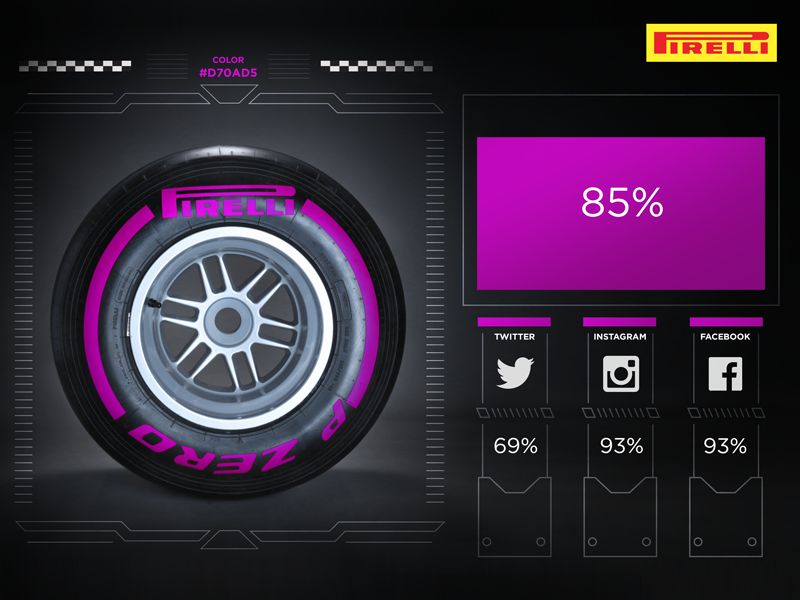 This colour was chosen by fans who were asked to vote for either purple or silver via Pirelli’s social media channels. Purple was a resounding winner, capturing 85% of the votes. Formula One: Opinion – Indycar Engine for Red Bull Racing? Last month I ran an opinion piece on my belief that Red Bull Racing will run an unbranded evolution of the current Renault engine under an Ilmor development programme. Whilst I maintain this is a possibility, the emergence of a client engine tender from the FIA presents another option. The FIA have not publicly stated the intended specification of the client engine, but it has been mentioned on several occasions that the engine is likely to be a 2.2 litre twin turbo configuration. By coincidence this happens to be the same configuration of the current Indycar engine philosophy. The existing Indycar engine weighs 114kg (compared to the minimum weight 145kg F1 engine) with power in the region of 650-700hbhp which would be 50-100 bhp less than the estimated F1 Power Units. Despite a power shortfall the Indycar engine has produced top speeds significantly higher than those seen from an F1 car, albeit racing on oval tracks. With engine mapping developments to suit F1 track design and gearbox technology, the Indycar engine could pose a formidable threat to the F1 engine in the right car. There are currently two engine manufacturers supplying engines to Indycar teams, these are Honda and Chevrolet. Whilst Honda produce their engine in house, the Chevrolet engine is developed and manufactured by Ilmor Engineering. As mentioned in my earlier piece Mario Illien, Co-owner of Ilmor Engineering, has had extensive involvement with Red Bull Racing in proposing a development route for their current engine predicament. Could it be that Red Bull though Ilmor have privately petitioned the FIA to introduce the existing Indycar engine specification into F1 under the banner of the client engine? If this is an option the only real question is why the FIA would suggest a tender for 2017 and not 2016? There is an essentially off the shelf solution waiting ready to go. Could the threat of the client engine for 2016 be the weapon the FIA’s arsenal in the fight against engine manufacturers control of Formula One? Could Red Bull Racing, possibly with the support of Bernie Ecclestone, have engineered this entire situation? Leaving the FIA with no real alternative than to allow the Ilmor design Indycar specification engine into F1 for 2016 or face losing two teams from the grid? Another factor to consider with respect to the Client Engine possibility is that Indycar engine manufacturers supply teams with engines through a leasing model at a cost of less than $4 Million per car per season. This is a fraction of the cost of current F1 engine supply agreements. If a client engine programme could be introduced into F1 with the performance parity the Indycar engine specifications suggest, then engine could be hugely attractive to all non-manufacturer backed / owned teams. Finally, the Honda engine in Indycar is a fast and reliable race winner; the FIA approving a shift towards this specification initially through the client engine could be music to the ears of the Honda Racing F1 engineers in Japan.